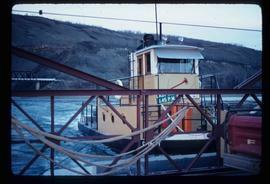 Image depicts the Clayhurst Ferry on the Peace River. 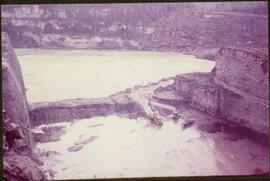 Item is a photograph of the construction of a temporary river bed to divert the Peace River during construction of the W.A.C. 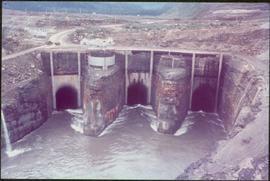 Bennett Dam. 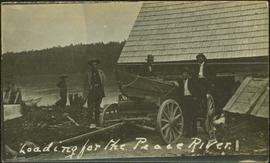 Inscription on back of photo: "Cree Indians gathered for Treaty Money. 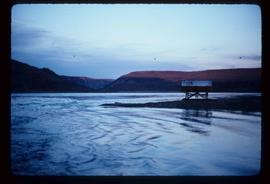 Peace River." 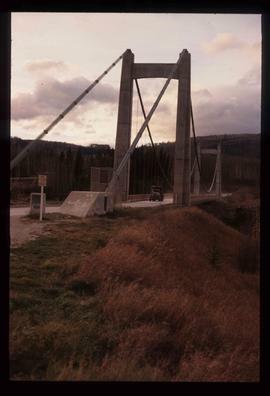 Item is a photograph of the diversion tunnel as engineers plan to blast the plug to allow the Peace River to be diverted for construction of the W.A.C. 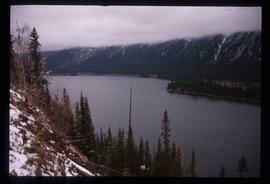 Bennett Dam. 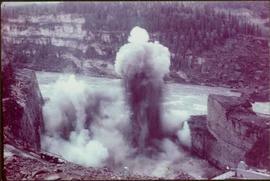 Item is a photograph of the explosion which opened up the diversion route for the Peace River during construction of the W.A.C. 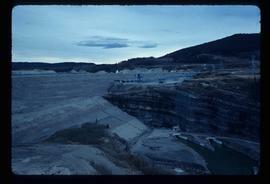 Bennett Dam. 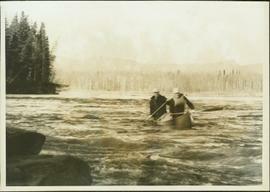 Photograph depicts a man standing in a small canoe, facing a second man walking along the shore. 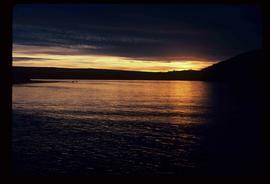 Hills on opposite shore in background. 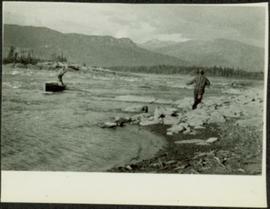 Handwritten annotation on recto of photograph: "Finlay Rapids. 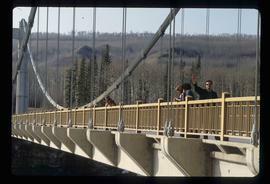 Peace River." 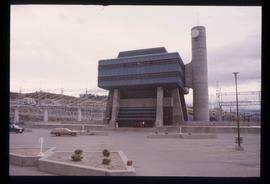 Image depicts the W.A.C. 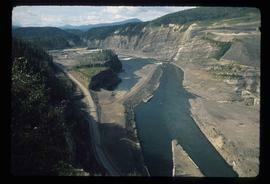 Bennett Dam in Hudson's Hope, B.C. 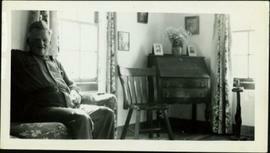 Photograph depicts Knox McCusker sitting in his living room. 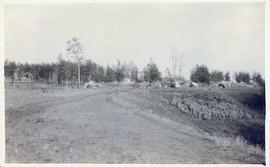 The caption on verso reads: “His home in Fort St. John on the banks overlooking the Peace”. 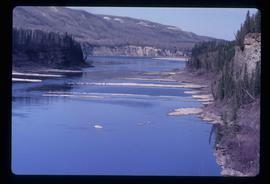 Image depicts the Peace River. 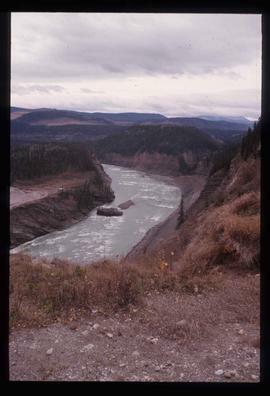 Image depicts the Peace River, possibly near Hudson's Hope, B.C. 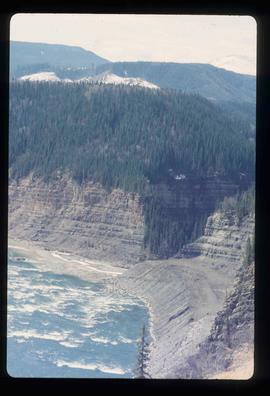 Image depicts the Peace River and visible layers of sediment deposits in the surrounding cliffs. 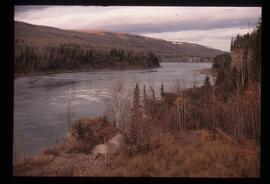 Image depicts the Peace River, possibly somewhere near Fort St. John, B.C. 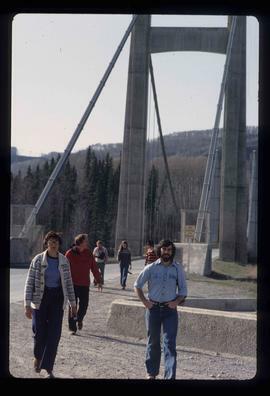 Image depicts several unidentified individuals and a bridge behind them; it is possibly crossing the Peace River. 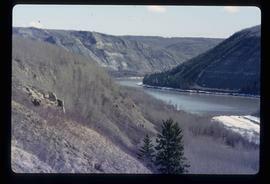 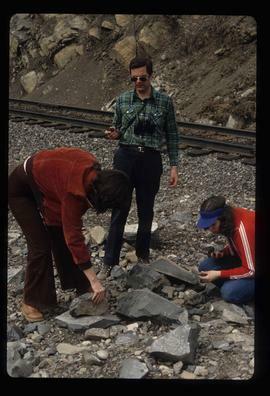 File contains slides depicting places in or near Pine Pass and along the Peace River. 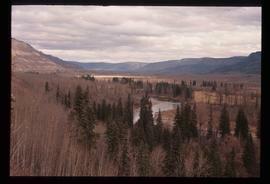 Image depicts what is either the Peace or Kiskatinaw River in Pine Valley, B.C. 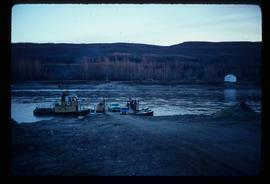 Item is a photograph of Mr. Williston and his son Dr. Hubert Williston in May 1967 canoeing down the Parsnip / Peace system before the W.A.C. 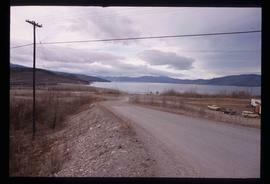 Bennett Dam flooded the area. 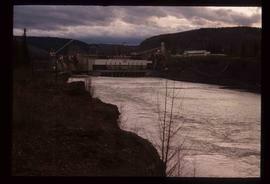 Item is a photograph of the three tunnels built to divert the Peace River around the Bennett Dam construction site. 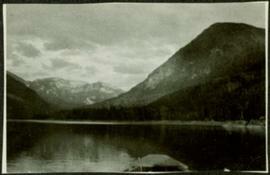 Photograph depicts Mount Selwyn rising on opposite shore in right midground. 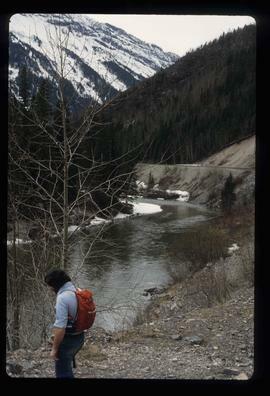 River in foreground, mountains in background. 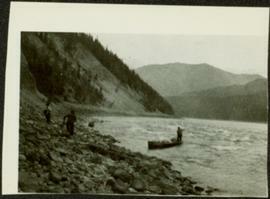 Handwritten annotation on recto of photograph: "Mount Selwyn Peace River." 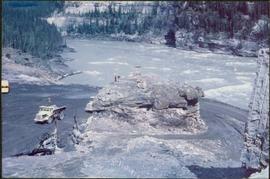 Image depicts a section of the Peace River blocked off by the W.A.C. 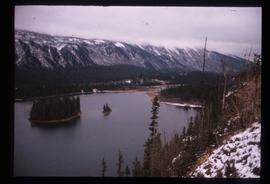 Bennett Dam. 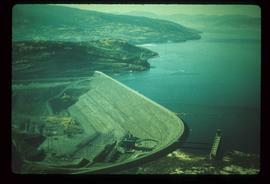 The dam itself is not visible in the image. 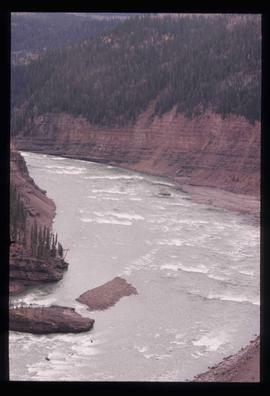 Image depicts a river, possibly the Peace River. 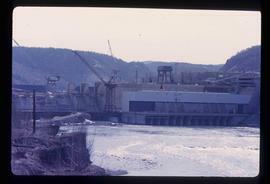 Image depicts a dam, possibly on the Peace River. 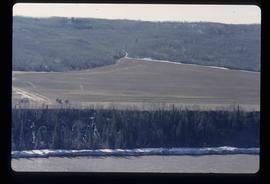 Image depicts a dam and a reservoir of water, possibly on the Peace River. 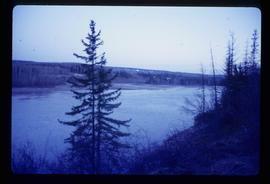 Image depicts what is possibly the Peace River running next to some farm land at an uncertain location. 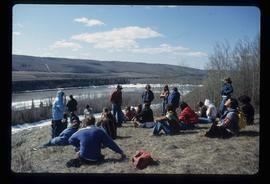 Image depicts a large group of unidentified individuals sitting on a hill; what is possibly the Peace River is visible in the background.